United Methodist Student Day calls the church to support students as they prepare for life in uniting faith with knowledge. The offering provides scholarships for qualified United Methodist students. A collection of resources has been collected to download and use in your own church communications. This kit (link: http://www.umcgiving.org/resource-articles/united-methodist-student-day-pastors-leaders-kit) includes Facebook images, infographics, e-books and other resources to help promote this United Methodist Student Day. 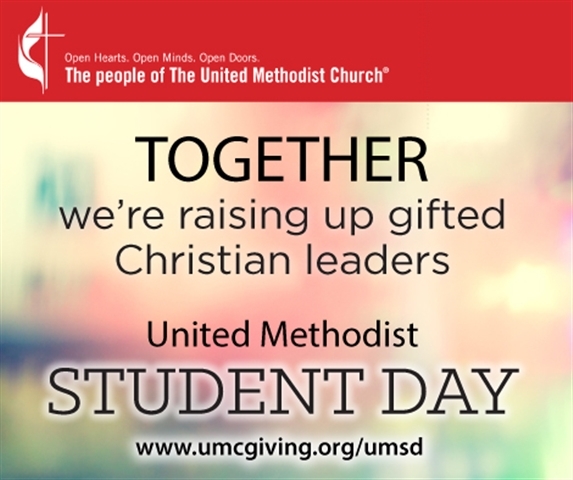 Thank you for your continued support of United Methodist Student Day offering.